Cold soup. It almost sounds like an oxymoron to our American ears, doesn't it? When I think of soup, I think of piping hot bowls of chunky goodness, recently lifted from a big pot that had been steaming away on the stove for at least an hour, preferably more. But really, there is no rule that says that soup has to be hot. I've even heard of chocolate soup for dessert (sounds awful to me! ), so I suppose that the only requirement of soup is that it be at least somewhat liquid, and eatable with a spoon. There are plenty of very popular cold soups. For instance, one variety of borscht is a beet-based, creamy cold soup. There's cold cucumber soup, which I have never had, but would love to try on one of the hot summer days here in Michigan (we just didn't have any of those this year). And of course, the wonderfully refreshing gazpacho: a cold, slightly chunky soup that is made from just about any garden vegetable that you care to throw in, but almost always tomatoes. I especially like mine with cucumber, a little bell pepper and onion, and zucchini, with a bit of avocado and a few big, homemade croutons tossed on top. If I happened to have a few lemon pepper shrimp laying around, I might add those to the bowl. It's a mind game. Once you try a cold soup on a hot day, you'll see that it really is good. And I don't think that any are better than vichyssoise, a cold soup made with potatoes, leeks, broth and cream. However, even if you can't get past the cold soup thing, give this a try, because it is equally delicious warm or at room temperature. And be honest: how often do you get to work with leeks? Let's get started. First, you need to prepare your leeks. 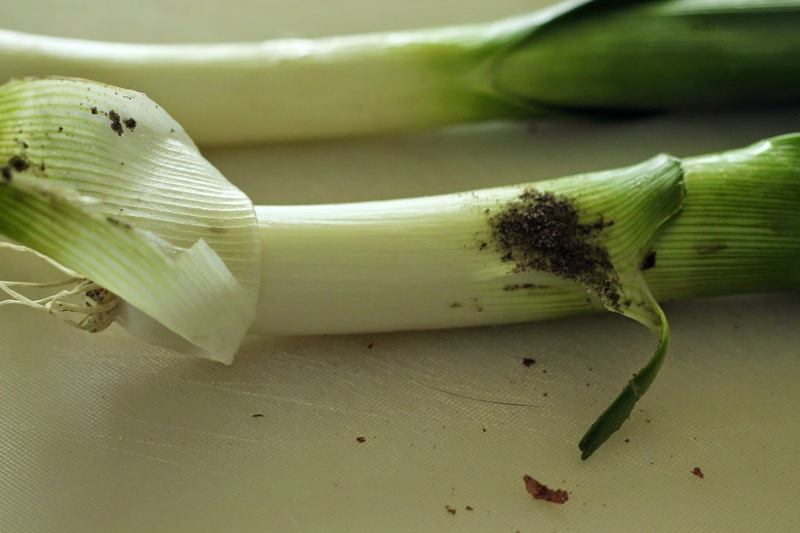 If you don't know what leeks are, they are a mild member of the onion family. Kind of like the quiet one that sits in the corner at family gatherings, and if you ever look over at them, they just have a kind of noncommittal smile on their face, nodding amicably. They get along with everyone. However, they are hiding a dark secret. I wanted to add the screeching Psycho theme sound effects there. It would have been perfect. One screech for each of the three pictures. Seriously, that would have been awesome. But I have no idea how to do that, and my son is at school, so I am out of luck. Anyway, leeks come to us with a lot of dirt inside. It makes sense, if you look at them. Unlike bulbous onions, leeks are rather lithe. They grow quite straight up from the ground. But like onions, they have petals that wrap around each other. So as they grow up out of the ground, some dirt gets caught between the petals, and stays there until you evict it. And the best way I know to get dirt out of produce (like cilantro) is to soak it. Of course, while you can just throw your herbs into the water and swish them around to loosen the dirt, you'll have to do a little more prep with leeks. For this recipe, we're going to slice them in half rings and sweat them, so let's just get the slicing done now, and soak them before cooking. First of all, we will not use the dark green leaves. Only the white and pale green parts are tender and yummy. I go a little nuts, cutting away the dark green of each petal, because the inside stays light green up higher, and I want all the usable material that I can get. However, if you are not nuts, feel free to pick a spot just under where the dark green starts, and just slice through the entire leek from there. It's what most people do. And if you make your own stock or broth, wash off the parts that you cut away, and throw them in your freezer stock bag. There's flavor in those dark leaves. They are just not very tender, which is why we don't use them here. 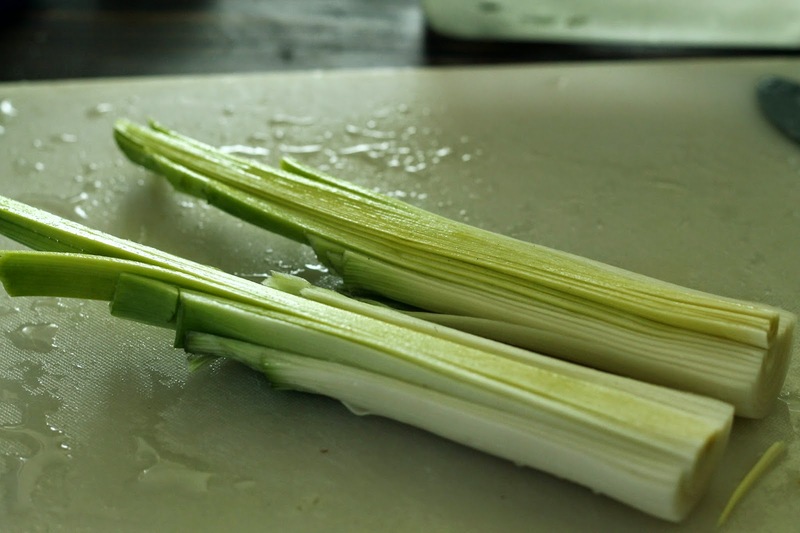 Okay, once the leeks are trimmed, you can slice them lengthwise in half, like the picture above. This will expose all of the petals. 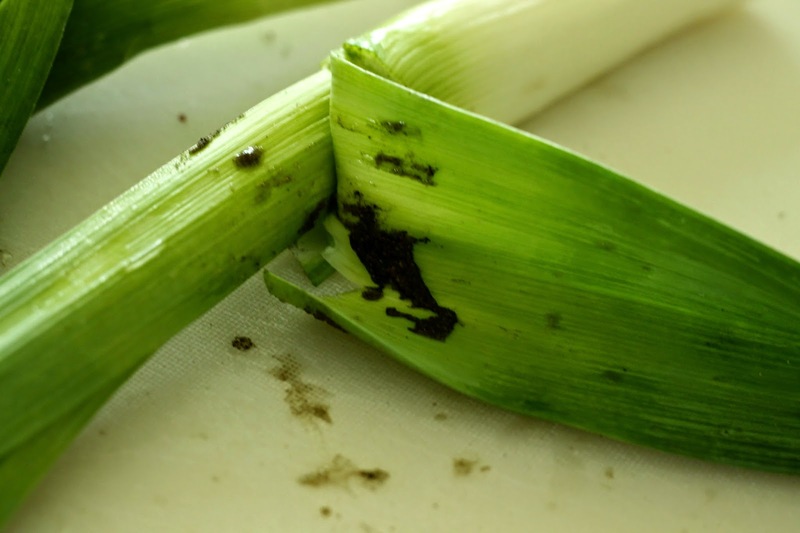 At this point, you could poke around in the leeks to see how dirty they are. Sometimes you get lucky, and they are not bad. In that case, you can sometimes just hold them under running water, pulling back some petals to let the water flush away any dirt. But usually, they are dirty enough that I don't want to take any chances (nothing ruins a delicate dish like vichyssoise like crunching into bits of soil), and so I slice. 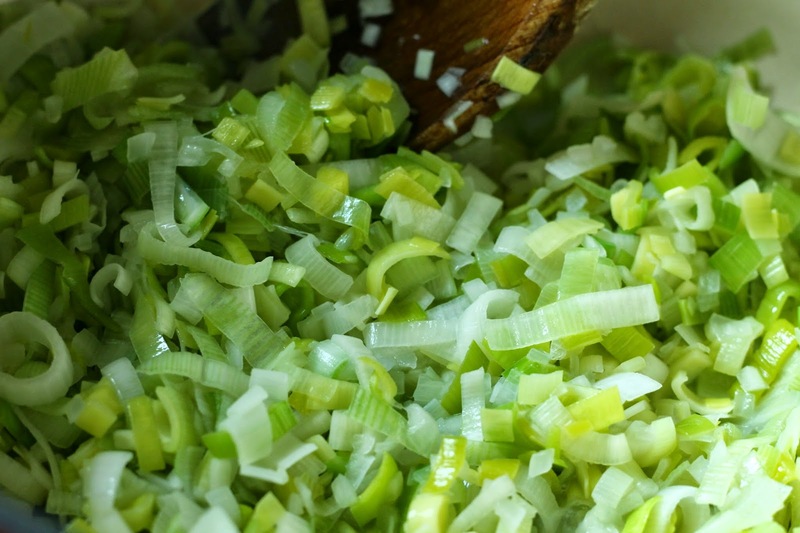 Turn the leeks over, cut side down, and slice somewhat thinly. Then fill a big bowl or bin with cold water. Drop the leeks into the water and swish them around with your hand. That will help to loosen the dirt. Let them sit like that for at least 10 minutes, while you chop an onion and start prepping the potatoes. When you come back, you will find that there is dirt on the bottom of the bowl, and your clean leeks are all floating on top. Scoop them out of the water, and place them in a sieve to drain for a bit. When the leeks are pretty well drained, melt some butter in a Dutch oven. Before it starts to brown, add the leeks and some salt. I like a little stronger onion flavor, so I add a small diced onion in with the leeks. 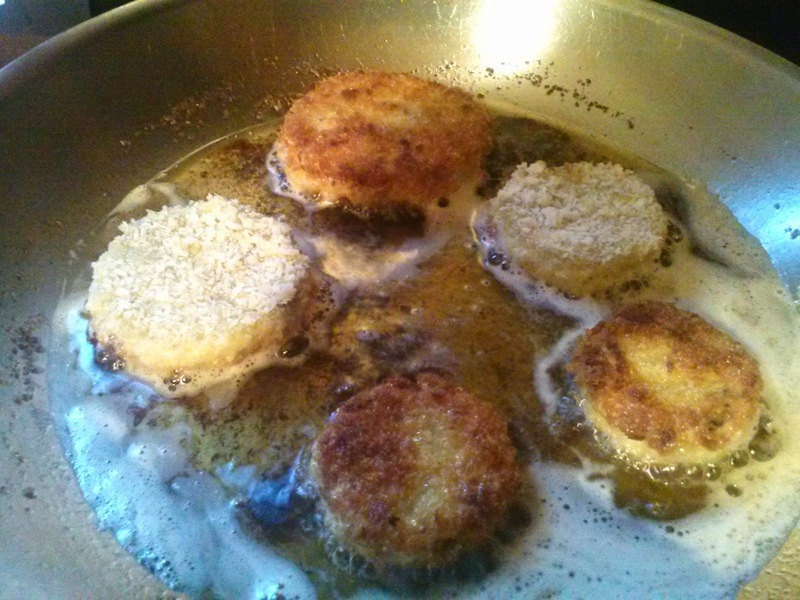 Stir them around to coat with the butter, then turn the heat down to medium low. 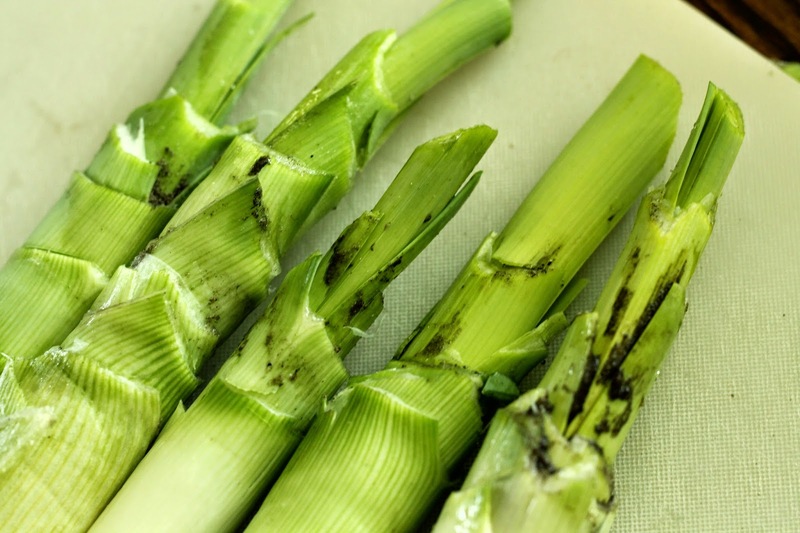 The leeks will give up some moisture (why this is called "sweating"), but will go limp and not brown, as they would do if you cooked them at a higher heat (saute) or for a longer period of time (caramelizing). For this soup, you just want them to get soft and tender, with no hint of brown. I usually cover the pot to keep the moisture from drying out, for extra protection. 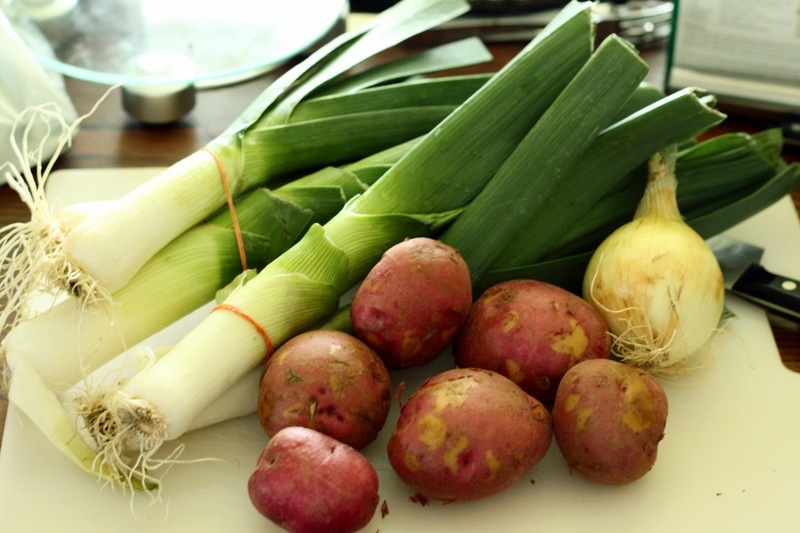 While the leeks and onion are sweating, prepare some potatoes. Now, if you want to be a traditionalist, peel the potatoes. This soup is supposed to be white, with the palest of pale green tint. It is also supposed to be smooth. Little bits of red potato skin floating around interfere with both of those goals. However, it's not critical. If it doesn't bother you, then leave the peel on. 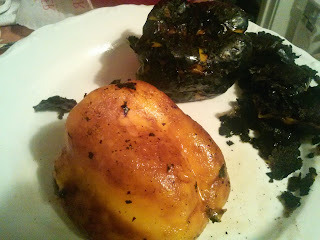 Just make sure that you use a tender skinned variety, like redskins or Yukon gold potatoes. 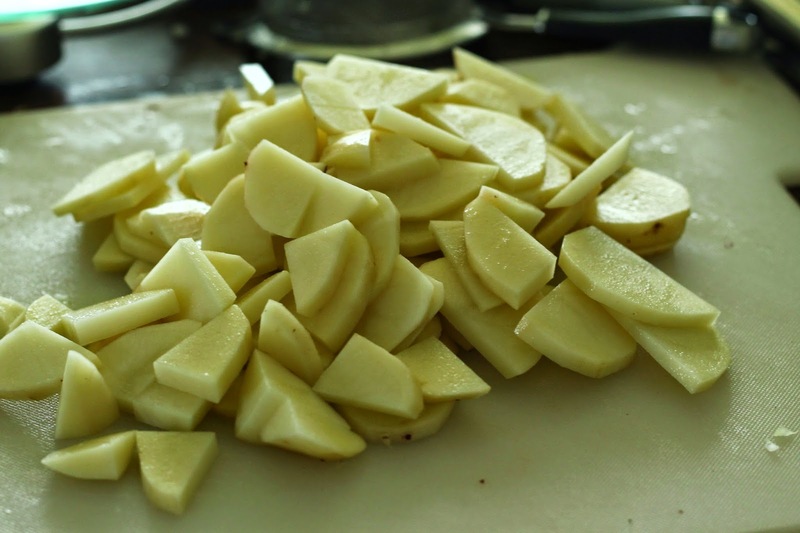 Either way, prepare the potatoes by cutting them lengthwise into wedges, then slicing the wedges into 1/4" pieces. Drop the potatoes in with the leeks, then add some stock or broth. You can use chicken or vegetable, but I personally like the chicken stock. Obviously, use vegetable broth if you want to keep this vegetarian. If you use purchased broth, make sure to use low-sodium. Go ahead and season with salt and pepper now. Again, if you want to be ultra-traditional, you can use white pepper, but since I don't generally have the time, money, or inclination to stock my spice shelf according to color, I just use black. Let the soup come just to a boil, then turn the heat down to a simmer, cover, and cook until the potatoes are tender. Now, it's time for more decisions. If you want a chunky soup, this is delicious, and you can add some cream or not, and serve as is. However, if you want vichyssoise, it's time to blend. And the choices don't stop there. You now have to decide how you will blend. I absolutely recommend using a stick blender. If you don't have one, I do think this is kitchen tool that is worth having, and the lower end versions are plenty adequate. I bought a $30 version years and years ago to make baby food. I never got around to making baby food, and the blender went missing between a couple of moves, but was eventually recovered from a box in the basement, and I wondered how I ever got along without it. There are so many ways to use it, even though it only does one thing. Use it to smooth out a chunky tomato sauce, puree squash for a smooth side dish, break down a cooked berry sauce (like cranberry sauce) or make a chunky soup smoother and creamier, like here. But not just this one. Jeff prefers cream soups, like cream of broccoli or cream of mushroom, to be smooth, with just tiny pieces of the star vegetable. No problem with a stick blender. Why bother with a stick blender, though, if you have a regular blender? Well, just life and health, that's all. Not that I have experience with this or anything, but if you put, say, a lovely, hot, chunky cranberry-orange sauce that has begun to break down over heat into a blender, and turn it on, it just might blow the top off and coat your arm the way it should coat the back of a spoon, since you were holding it with what seemed to be adequate pressure to keep this blowout from happening. You might end up celebrating Thanksgiving with a reddened and tender arm. That wouldn't happen with a stick blender. Use a stick blender: Immerse the bottom of the blender all the way into the soup, then turn it on. You want to keep the blender at a very shallow angle, tipping it just enough to keep stuff moving through the blades, but not so much that any part of the blade will rise above the surface of the soup, because it will splatter if you let it go too high. Move it around for maybe 30 seconds, and you will have a nice, smooth soup. Easy peasy. Again, stop the blender before you lift it out of the soup. The bottom of the blender should disconnect from the handle (where the motor is), so you can just pop it in the sink or dishwasher (though models vary, so check yours before washing, or preferably, before buying, to make sure you can throw it in the dishwasher!). 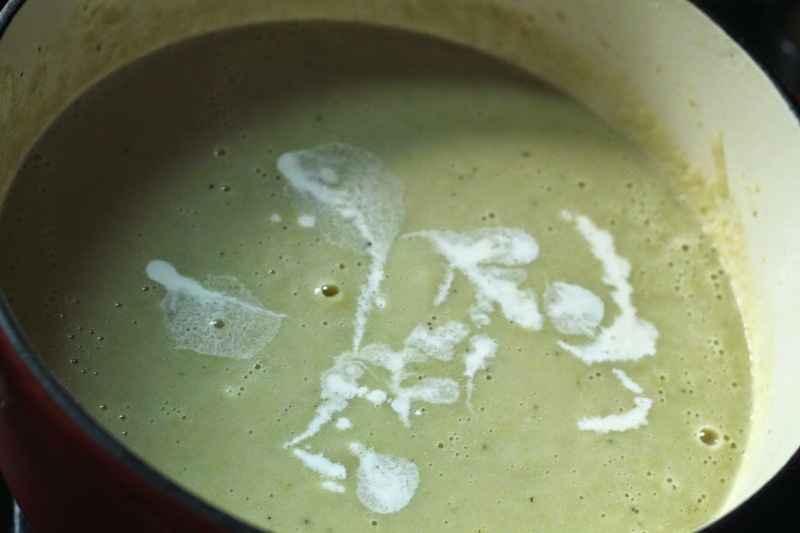 Use a regular blender: Let the soup cool for a couple of minutes. Puree in small batches, filling the blender no more than 1/3 of the way. Place the top back on securely, then place a kitchen towel, folded a couple of times, over the lid. The towel should overlap the lid, especially in the front, where your arm will be. Now, place your hand over the towel and apply firm pressure. I'm not saying that you have to put your weight in it, but make sure that you are really pressing down. Now you are ready to blend, but make sure that you start slowly, at the lowest speed. This is where the pressure will cause the lid to blow if you are not applying the right pressure. You will feel it. But if you are applying enough pressure, you will emerge victorious over the blender. After several seconds, you can move on to the next speed, and continue until you have pureed the contents. Now you will need to pour the pureed soup into a large bowl or pitcher to make room for the next batch. Repeat this process 2 or 3 times, and then you can pour the pureed soup back into the empty pot. Use a food mill: If you can tomato sauce or make your own baby food, you might have a food mill. It's old school, low-tech and dependable. There are lots of uses for food mills, and they're pretty inexpensive, so having one around is not a bad idea. Use the finest disk that came with it, and ladle some soup into the mill. Turn the handle slowly, and occasionally back up, turning the handle the other way to clear the debris. The benefit of this method, beyond the virtual impossibility of exploding soup, is that there is no need to peel the potatoes. The screen will catch the peels and leave your soup very smooth and luxurious. Of course, it is also the slowest method, so know that going in. If you want a really, really smooth soup, and I mean silky in texture, then go ahead and pour it through a fine mesh sieve, stirring and then pressing it through with a spoon. I have never actually bothered with this step, so I don't know what I'm missing. If I ever do, I fear there will be no going back and I will become obnoxiously adamant that this is the ONLY way to make proper vichyssoise. But for now, I am blissfully ignorant, and will just throw that out as an option. Alright, now the hard part is done, and we are coming to the big vichyssoise finish line. Actually, this is a super-simple soup and takes very little effort, but it looks like loads of work, since I am going to such pains to ensure that you have no dirt in your soup, and that you don't get third degree burns all over your arm. Seriously, take a look at the printable recipe, and you'll see how short it is without my end-of-the-world warnings. Now it is time to add the final touch of creaminess and richness. Most vichyssoise recipes just call for cream, but it does tend to mute the oniony (I didn't want to say leeky--I'm sure you understand) flavor of the soup. Cook's Illustrated suggests cooking the potatoes in a mixture of broth and milk. However, I prefer Alton Brown's method, which uses a mixture of cream and buttermilk. Brilliant! 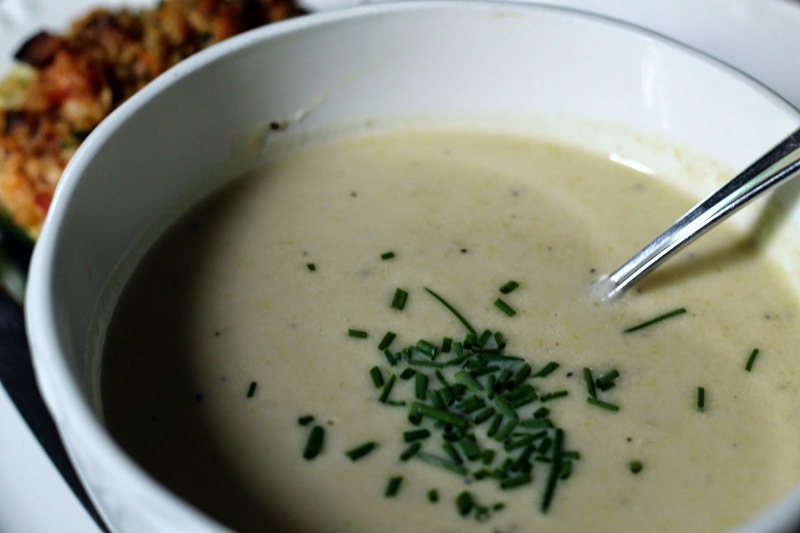 The buttermilk gives it a tang that is just perfect with leeks and potatoes. It does not taste like you are drinking buttermilk. I would not be down with that, either. But if you have ever tasted buttermilk ranch salad dressing compared to a dressing prepared with regular milk, you know what I am talking about. Buttermilk just adds the perfect touch that keeps creamy foods from tasting bland and boring. So just stir the cream and buttermilk into the soup, and serve warm or allow it to come to room temperature, then chill in in the fridge. If you choose to cool the soup, make sure to check the seasonings before serving. This is getting a little deep into the science of cooking for my brain, but there are some flavor compounds that are undetectable by the taste buds unless they are heated up. So something that tasted perfect hot, may taste bland cold. Cook's Illustrated said so. Or something like that. If served cold, I like to sprinkle with a few snipped chives. If warm, I like to top with a couple of herby, peppery croutons. You can make your own by cutting leftover crusty bread into 1 inch cubes, tossing them with a mixture of olive oil, melted butter, salt & pepper, garlic powder, cayenne, and a bit of minced herbs of your choice. 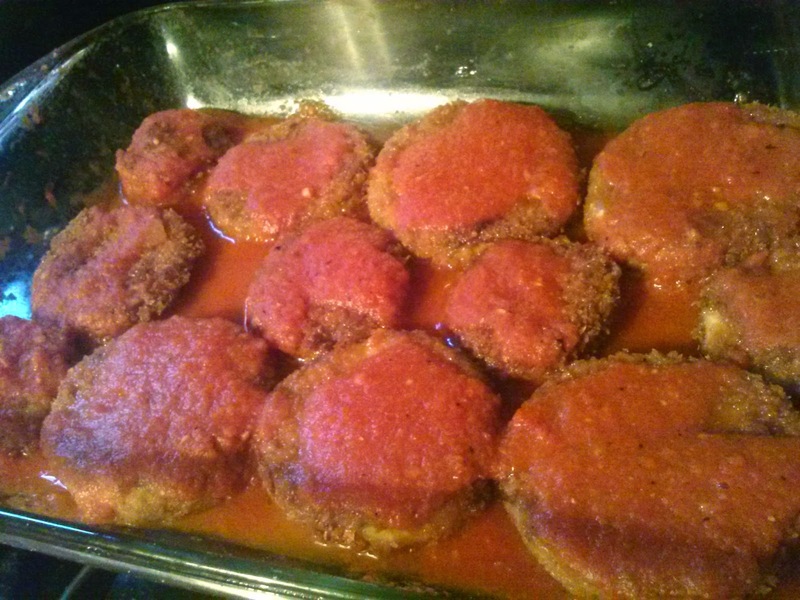 Then pop them on a sheet pan and bake them in a 400 degree oven, tossing occasionally, until they are crispy. Warning: these are addictive, and your kids might not want to eat anything else you place before them. But they really come in handy over soups, salads, or even ground up as a topping for casseroles. You can vary the flavors however you like. 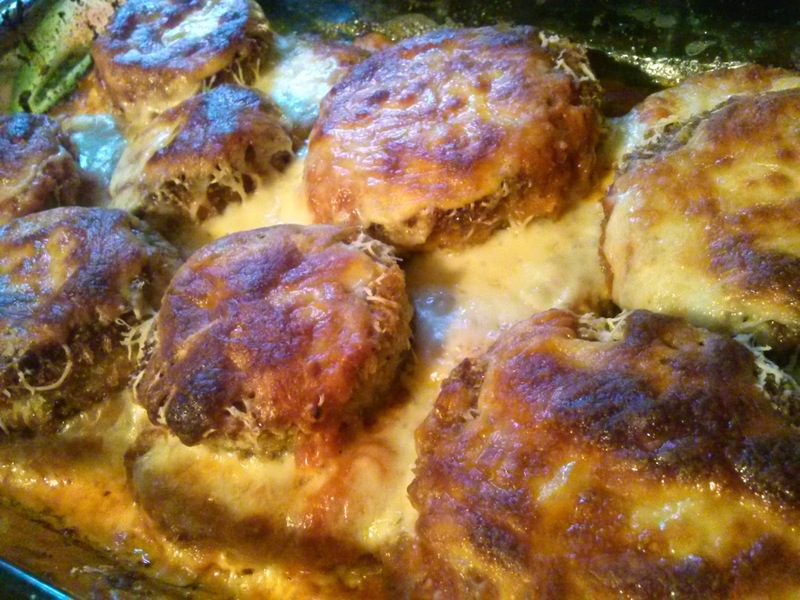 Add grated cheese, minced fresh garlic, and any spices that suit your needs. BONUS RECIPE! So that's it. It's really not more than an hour or so, start to finish, and you're hands-off for a good part of that. Give it a try. There are so many variations to choose from, but the flavors are just fantastic, no matter which direction you take it. I was never much of a vegetable fan. I was okay with salads, and potatoes, of course. Canned corn and green beans were always good. 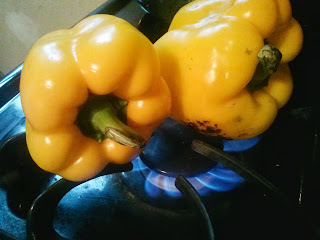 But I hated peas, carrots, zucchini, Brussels sprouts, asparagus, peppers, onions (unless they were cooked and in something), and the list could go on. I didn't even want to think about eggplant or beets. Of course, for the most part, veggies came to the table boiled, and that's just the way it was. 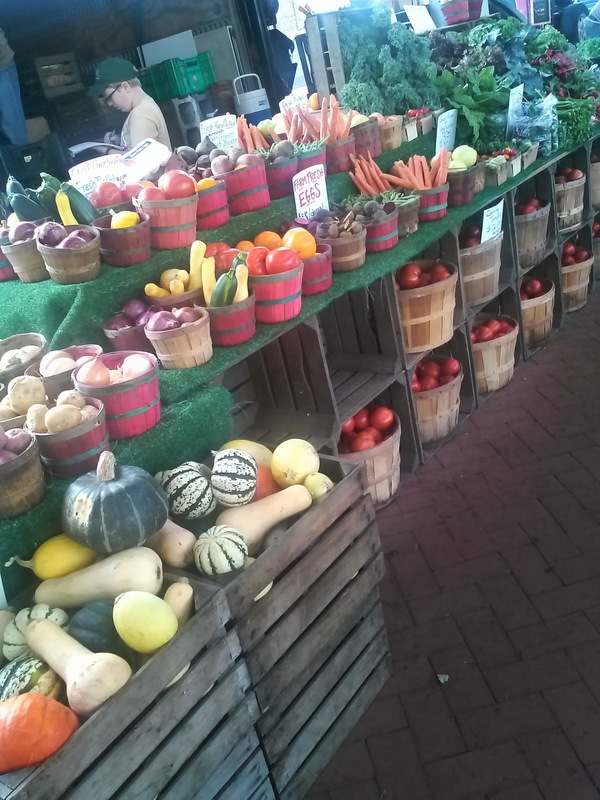 Fresh, local produce from the farmers' market just wasn't something that was available often. 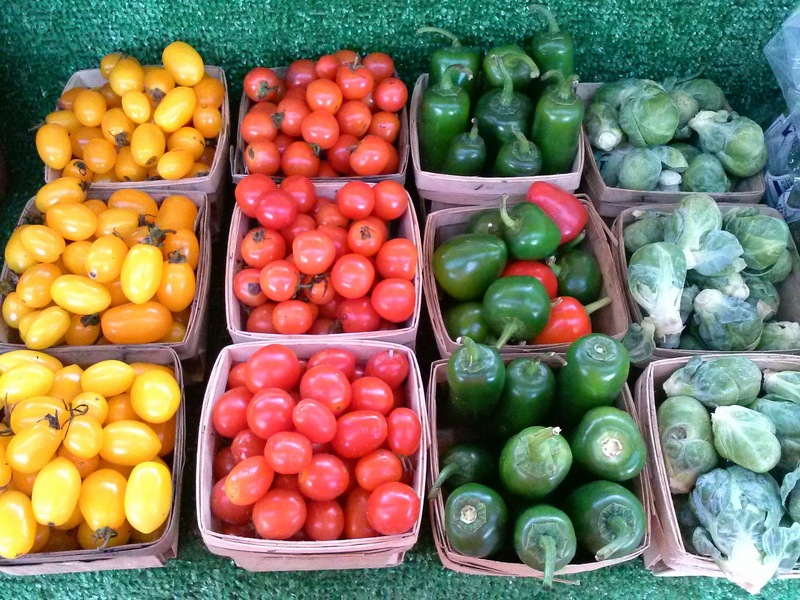 But my dad grew up on a farm, so he had developed a taste for enough vegetables that we had a fair variety, even if they came from a can. 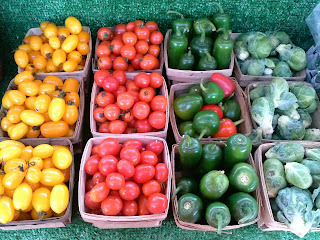 I still don't like most canned vegetables (exceptions still being corn and green beans), but I have become a big fan of many vegetables if they are prepared in a way that allows their natural sugars to shine through. Usually, that means a lot of heat, and a lack of moisture, such as you get by sauteing, roasting, and grilling. It doesn't get much better than a big sheet pan full of Brussels sprouts, tossed with a bit of olive oil, coarse salt and pepper, and well-browned with some crispy bits (unless you happened to have a little bacon grease fall into the pan, totally by accident--that could make it a little better). 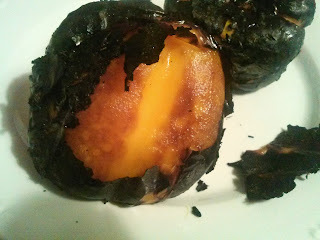 But even cubed up carrots, beets, potatoes and winter squash benefit from a bit of time in a hot, dry oven. Broccoli, with some garlic and olive oil before roasting, finished with a little lemon zest and parmesan cheese after coming out of the oven, is delicious. Zucchini and asparagus are, in my opinion, best sauteed until there is some nice browning and a bit of shriveling. Even fresh green beans on the grill until they shrivel are a fantastic alternative to the usual boiled. 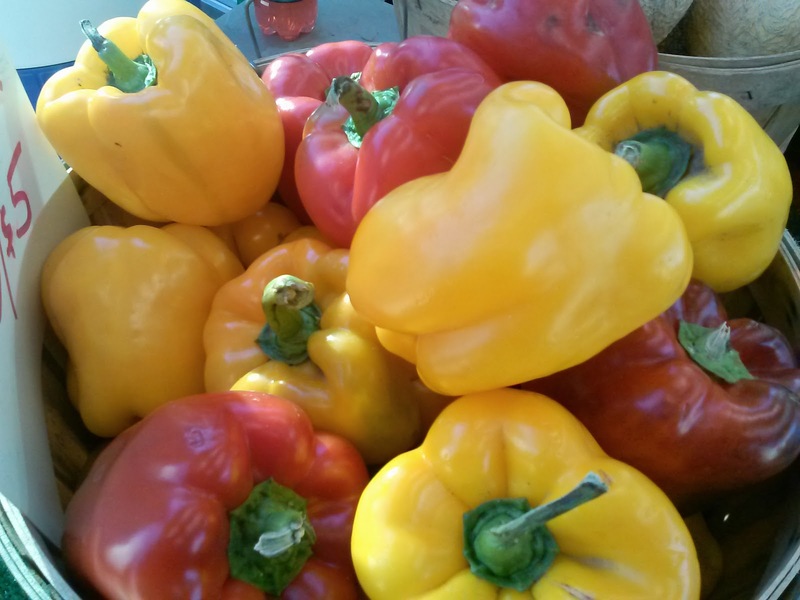 So I have learned to appreciate vegetables for what they bring to the table, and that has led to some fantastic discoveries. Ten years ago, I probably wouldn't have given a thought to ratatouille, even after watching the cute movie by the same name. However, having learned how to cook in that time, watching the movie made me want to give it a try. I think that the first time ratatouille made a blip on my radar was when I was watching Food Network Star several years ago. Melissa D'Arabian, who ended up winning that year, prepared ratatouille for a panel of guest judges. They absolutely loved it. She explained that her mother-in-law taught her a trick to remember what is essential to ratatouille. EZ-POT. That stuck with me, and I always remember it at the market when I am mentally going through my grocery list with ratatouille on the menu. The first time I actually made it, I sort of, kind of followed a recipe. But, as will happen when you're not that organized, I had the wrong amount of some ingredients, didn't have the right herbs, and accidentally used too much broth. And it was delicious! So I kept the mistakes, and haven't looked back. It's a pretty traditional version of ratatouille, except that I serve it with pasta. For kids, and honestly, for me, too, the veggies just needed something to break them up. It can be somewhat texturally monotone. Al dente pasta gives you something to chew on, and it also just serves as a background for the bright flavors of the peppers, onions and herbs. The flavor is all still there, but it's not quite so in your face. This is a dish that involves a fair amount of prep, and it's a good idea to get everything ready to go before you turn the stove on. 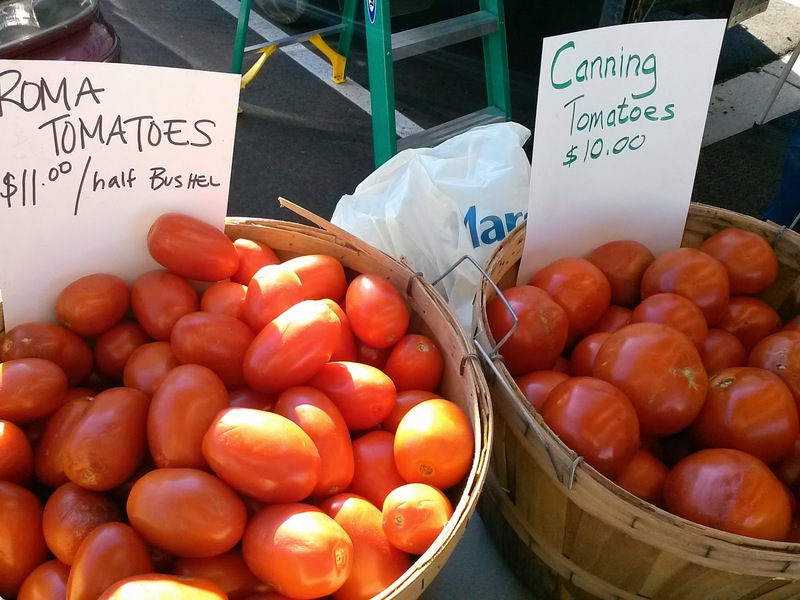 First up: tomatoes. I've been canning tomatoes lately, so I am in the groove. Boil some water, cut an x in the bottom of each tomato, dunk it in the boiling water for 45 seconds, then use a spider to lift it out, and dunk it into a bowl of ice water. Then the peel slips right off. However, I am at a point where I have several ripe tomatoes, lots of under-ripe tomatoes, and a few over-ripe tomatoes. So I pretty much went at the over-ripe ones with no mercy, cutting the soft spots, the burst seams, and anything that seemed the least bit gross, away. Down the disposal they went. So I had lots of little pieces and halves to use up today, and that's what I did. Once I had the tomatoes peeled, I broke them apart enough to scoop the seeds out over a sieve set over a bowl. Doing this catches the juice in the bowl, and keeps the seeds separate. Discard the seeds, but save the juice. 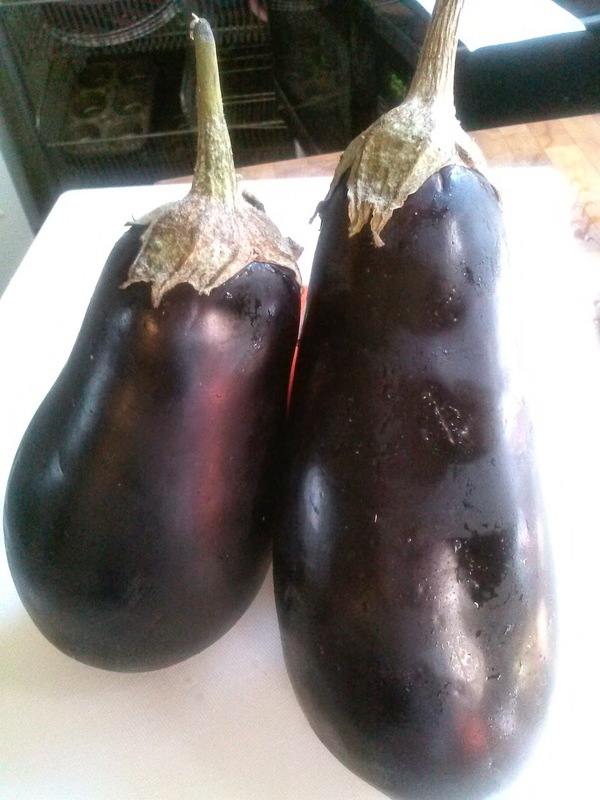 Now it's time to start the eggplant. You can keep the skin, or lose it. The skin is such a lovely color, but I can't take the texture of cooked eggplant skin, so I peel. Then I slice it into thick discs, between 1/2" and 3/4". Place them on a cooling rack set over a sheet pan with 4 sides. Sprinkle heavily with coarse salt, and let them sit for about 10 minutes, or until you see several drops of liquid on the surface of each slice. Then turn the discs over and salt the other side. Let them sit like that while you prep all the other veggies. Peel and large dice a couple of onions, and mince about 4 cloves of garlic. Remove the stem, seeds and ribs of 4-5 sweet peppers. I like to use lots of colors here, and I happened to have some orange, yellow and red around, so that is what I used, Cut these in a large dice, as well, and set aside. And now, it's time to cook. Heat up a large skillet (not Teflon), and lube it up with about a tablespoon of olive oil. Once the oil is shimmering and very hot, add the onions. Sprinkle with a pinch of salt, and toss to coat lightly with the oil. Let the onions cook, stirring occasionally, until you see a bit of nice golden color, but don't let them burn. Place another large skillet, or better yet, a heavy Dutch oven, over low heat on another burner. Once you have nice color on the onions, scrape them into the Dutch oven. 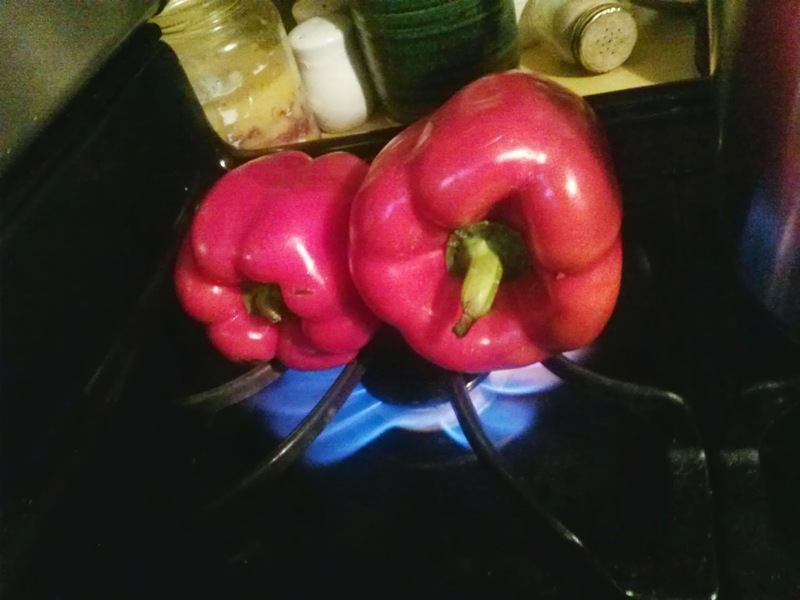 They will sit there, over low heat, while you saute all of the other veggies, and will become somewhat caramelized. Yum. Bring the pan back to screaming hot, add a little more oil, and then add half of the peppers. At this point, I do not add any more salt. 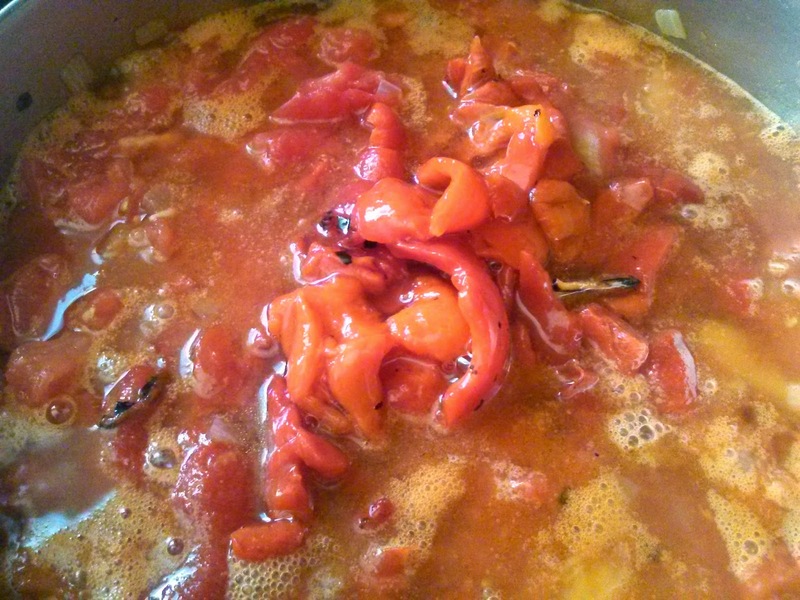 This is because I want the peppers to brown a bit, and if I add salt, it will pull some of the juice out, and they will end up simmering. They will have plenty of time to get soft and release their juices later. Right now, I want to concentrate the sugars and get some color on them. Once they look right, stir the onions a bit and scrape the peppers on top of the onions. Repeat with the other half of the peppers. 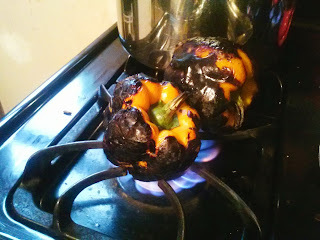 Once all the peppers are in the Dutch oven, you can season them with salt. At this point, you may need to deglaze the pan. If you haven't done this before, you may be freaking out, thinking that you burned something, and your pan is ruined. That couldn't be further from the truth. All that burnt-looking stuff is actually quite delicious, but it has to be liquified to take advantage of it. Fortunately, that's easy. Place the empty pan back over high heat and let it get quite hot and dry. 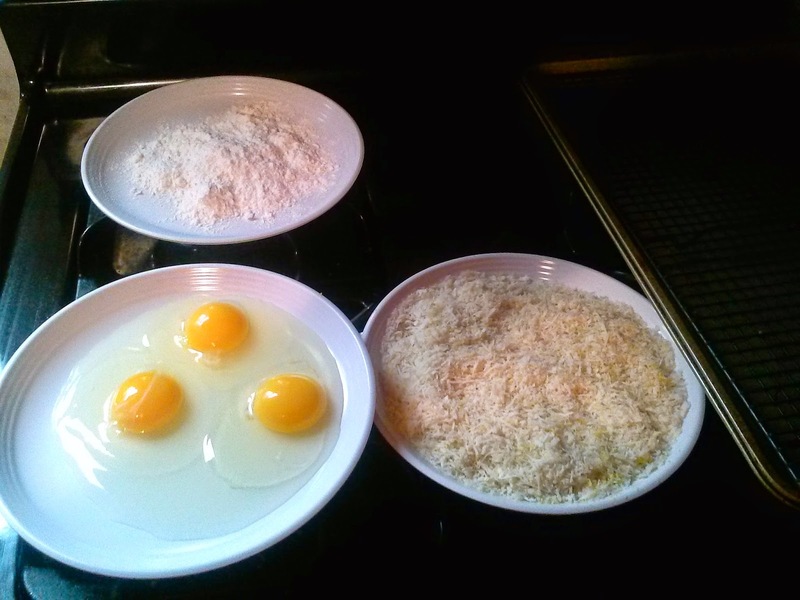 Now pour some water into the pan and immediately begin scraping the brown away with a wooden spoon. It will come up surprisingly easily, and turn the water a lovely deep brown color. Once you have most of the brown off of the pan, pour the liquid into a measuring cup. You shouldn't need more than half a cup of water for each deglazing. Save this liquid for a little later. 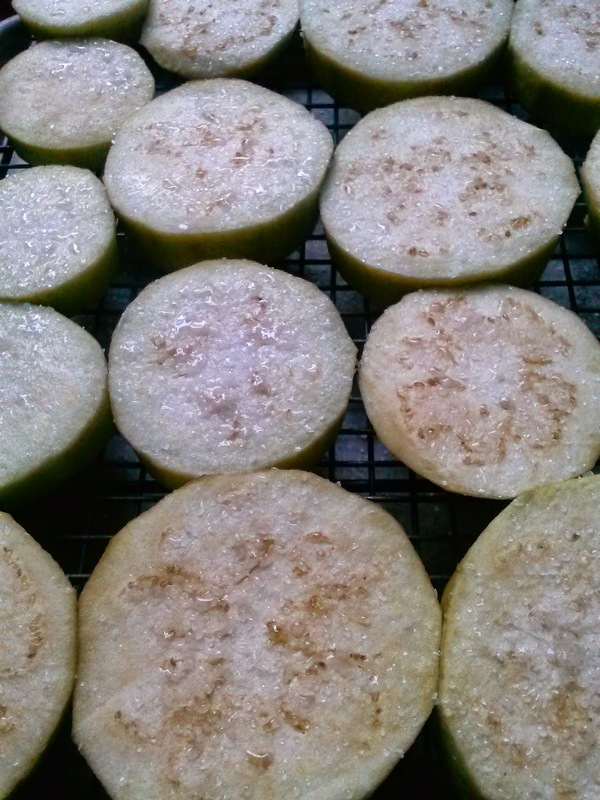 Now, move on to the zucchini and the eggplant, which you can shake off and dice while the zucchini cooks. Just add a bit of oil as needed between batches, and let them cook long enough to get some color before moving them over to the Dutch oven. 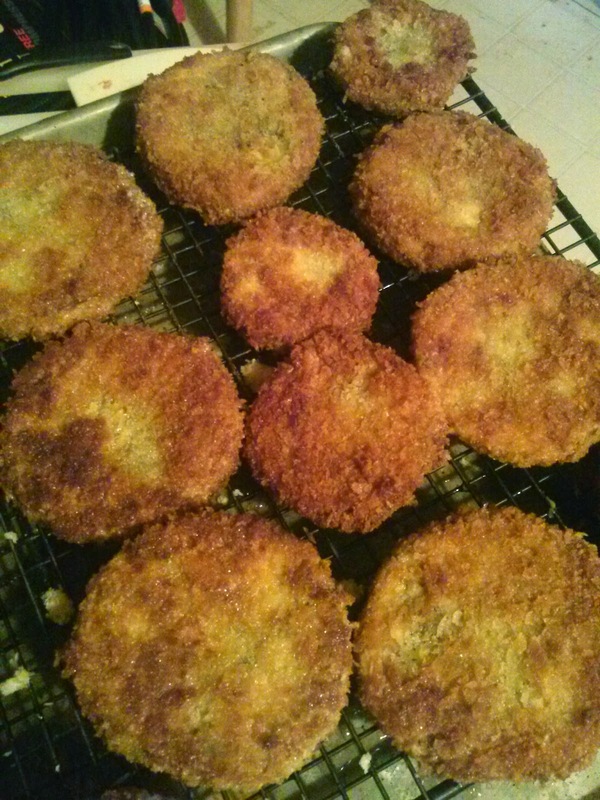 I actually do the zucchini and eggplant in three batches to avoid overcrowding the pan, which can also lead to steaming. I also deglaze again after the zucchini is all done. Remember to add some salt to each layer as you move it over to the Dutch oven. 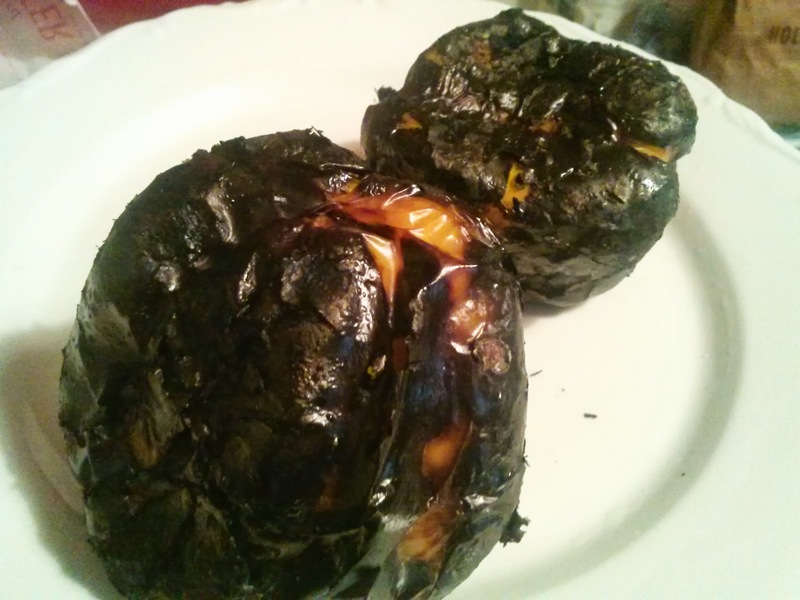 After the eggplant is done, I deglaze again, but this time, since there's not a lot of flavor, I am really just doing it to make cleanup easy later. I just discard this water. Now just tear the tomato pieces into smaller bits, using your fingers. Add the flesh to the Dutch oven, and add any juice to the measuring cup. Now give it all a stir and appreciate the gorgeous colors of the dish that you are creating. Really, appreciate it, because it's not going to look like that much longer. 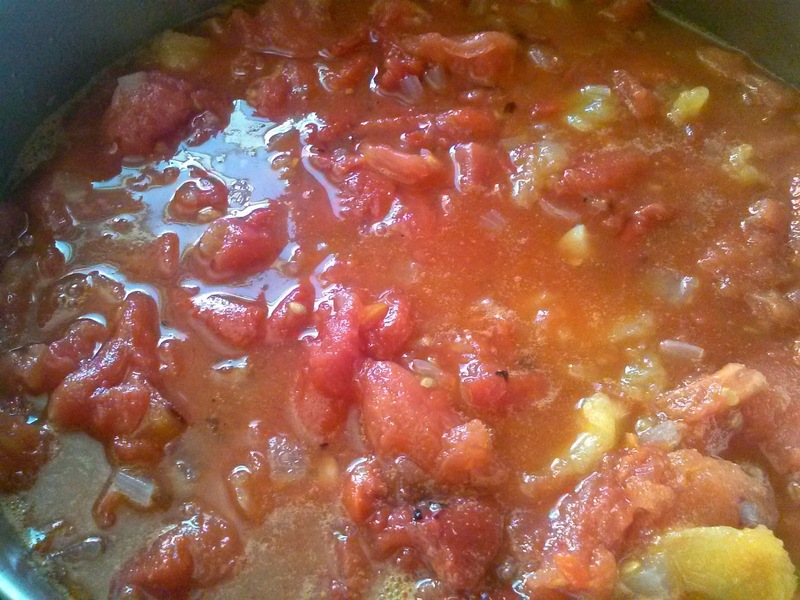 Now, you can use vegetable broth here, but I happened to have lots of juice left from canning tomatoes, and I have plenty year-round because I can the leftover juice, as well. So I just use the juice to measure up to 3 cups of liquid, combined with the deglazing liquid. Add this to the Dutch oven, and turn the heat up to medium. When I first made this, I was supposed to use fresh thyme and rosemary. I didn't have any. I was even out of dried thyme. But while digging through the spice rack, willing the thyme to appear, I noticed a little jar that I had bought for fun while on a Penzey's run, and decided that this was as good a time as any to give it a try. Herbes de Provence is an herb blend. Think a French version of "Italian seasoning". It usually includes thyme, savory, marjoram, fennel seed, and rosemary. It has a pleasant floral aroma, and for good reason, because it also often uses lavender. It's wonderful. I add nearly a tablespoon, but you can add less to start, and add more later, if you decide that you love it as much as I do. Once the liquids start to simmer, turn the heat down a bit and put the cover on the pot. Now you get to walk away. It can stay there for an hour or so. Or, if you are uncomfortable leaving the house with a pot on the stove, place an oven-safe pot into a 375 degree oven. Once I got home from picking the kids up from school, this is what I found. And the smell.....mmm. The final step is an idea that I saw on simplyrecipes.com. Place a colander inside of a large bowl, and pour the ratatouille into the colander. Stir it around a bit to help the juices drain. Lift up the colander, and pour the juices into the pot. Put the colander back into the bowl, because the juice will continue to drain for some time yet. Every once in a while, add whatever juice has collected in the bowl, into the pot. 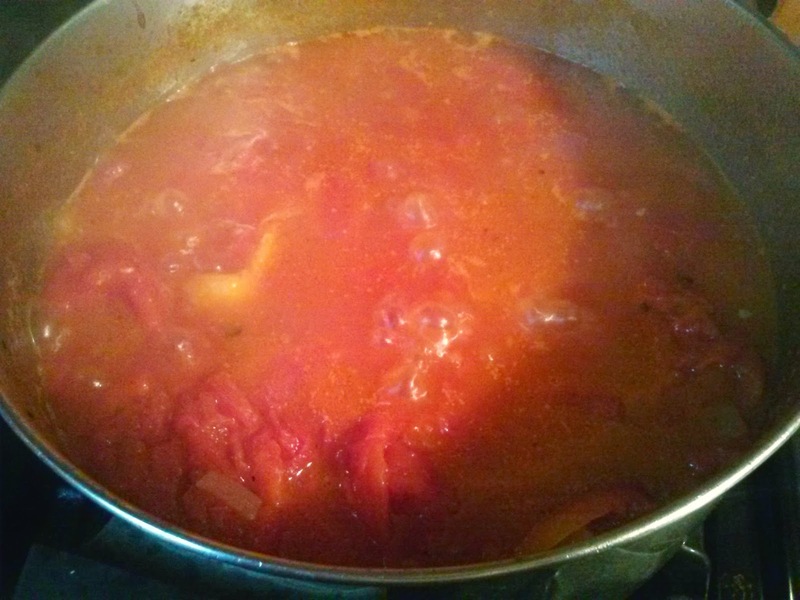 Bring the juice to a boil, and then turn the heat to medium and let it simmer hard until reduced by half and you have a slightly thickened, rich-looking sauce. Finally, add the veggies back to the reduced sauce and stir to coat. Now usually, I serve this with rigatoni, which is a nice, sturdy, large pasta that stands up to the chunky veggies. I had planned to run out and buy some after school, while the juice was reducing. But I got caught up with helping my 7 year old son with his convoluted math homework (courtesy of Common Core), so I had to settle for the penne from the pantry. And here it is. It's delicious, comforting, homey, and nutritious. Give it a try sometime, and if necessary, pop the movie in to get the kids to give it a try. It worked for us!